On February 19, 2016, the Sacred Island of Naitauba in Fiji was directly impacted by Tropical Cyclone Winston. The eye of the storm passed directly over Naitauba and there was very severe damage to the Island, yet Avatar Adi Da’s Spiritual Presence was completely Untouched and Radiant. Devotees and friends of Avatar Adi Da came together to serve and restore the holy places. The music collected on this CD is drawn from offerings made during the year after the cyclone hit, in honor and worship of Avatar Adi Da and His Ceaseless Blessing of all beings. Significant to note is that track 2 was the first sacred occasion in the temple Is-Da Happen since the cyclone hit in February. 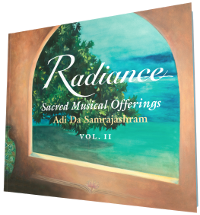 The painting on the CD cover, by Nara Wood, is of the “chanting room” at Samraj Mahal, where countless musical offerings were made to Avatar Adi Da during His Lifetime when He was spending time there. Compiled and produced by Aaron Nakagawa, Antonina Randazzo, and Caroline Lindsay. The Master’s Day Begins 1:21 7:00 AM conch and lali drum. Chris Merz: conch; Sekope Galo: lali drum. Ruchira Avatara 12:00 Caroline Lindsay: vocals and harmonium; Simon Evans: vocals. Praise You Lord 8:36 Lucy Arque, vocals and harmonium; Greg Wells: drum. “My Supremely Free Disposition” 7:38 Antonina Randazzo: vocals and tanpura; Grace Evans: vocals; Siegerdina Mandema: tanpura; Leroy Stillwell: shakuhachi flute. Om Bhagavan Da 12:25 Rick Evans: vocals and harmonium; Aura Bakker: vocals and drum; Caroline Lindsay and Antonina Randazzo: vocals; Greg Wells: drum. “Those Who Fall In Love With Me” 11:50 Aura Bakker: vocals and harmonium; Jonathan Greene, Simon Evans, Alexandra Fry: vocals. Avatara, Avatara 8:20 Bill Somers: vocals and harmonium; Alexandra Fry: vocals and drum. Da-Om, Om-Da 17:07 Steve Brown: vocals and harmonium; Jacqueline Clemons: vocals and drum. “Atma Nadi” 7:30 Steve Brown: vocals. Om Sri Adi Da 10:26 Jacqueline Clemons: vocals and harmonium; Colin Boyd: drum. Om Sri Avatara Adi Da 12:09 Caroline Lindsay: vocals and harmonium; Simon Evans: vocals. Veranda Gentle Tide 1:22 Sound of the Pacific Ocean recorded from the Veranda of Avatar Adi Da’s residence at the Matrix.